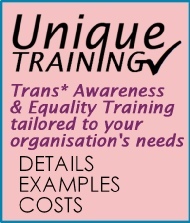 Outreach into into the wider community is one of Unique's key objectives, both to Trans* individuals who may need help and encouragement, and to the general public to promote awareness of transgender people and issues. 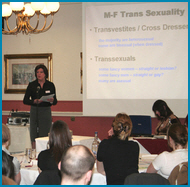 Estyn allan i mewn i'r gymuned ehangach yw un o amcanion allweddol Unique, i unigolion trans y gall fod angen cymorth ac anogaeth, ac hefyd i'r cyhoedd yn gyffredinol i hyrwyddo ymwybyddiaeth am bobl drawsrywiol a'u materion. 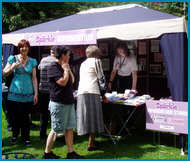 Taking part in public events, such as Sparkle (the national transgender festival in Manchester), local Pride festivals and International Women's Day.